1. The text is simple - perfect for children learning to read, perfect for older children to practice fluency (reading with speed and emotion) with. (The girls LOVE reading this series to Quinn! And I love hearing them become better, more fluent readers!) Their speech is in word bubbles and it is easy to distinguish who is speaking. 2. Children get these books! The character's thoughts and words are easily relatable to small children. They get it! And they LOVE that they get it! 4. They are funny! We all laugh while reading Elephant and Piggie and I highly recommend reading funny stories with your kids! Why? Because if you're laughing, then you're having fun and reading should be fun...especially when it comes to reading with small kids. (I'm certainly not saying that the Political Science textbook that I had to read in college was fun, but I think you may have understood that!) I love laughing with Quinn at bedtime because it helps me forget that he knocked over his milk at dinner, spit on his sister, pulled the dog's tail and made our house looked like a tornado touched down in it. I forget about all of those things (and he forgets my stern voice, angry eyes and the time outs that he served) and we end our night together on a high note. 5. They are not gender specific! This is something that we struggle with in our house. After having two girls, we have a ton of Barbie, Disney Princess and Fancy Nancy books and even though we do not say "this is girl" or "this is boy" in our house (I mean, really, Quinn had a pedicure from March to August! ), Fancy Nancy is a hard sell for him. I have also found that in my library Elephant and Piggie is loved equally by girls and boys. Quinn's favorite Elephant and Piggie Book:::There's a Bird on Your Head! 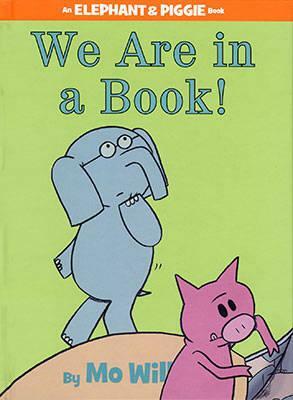 Casey and Chandler's favorite Elephant and Piggie Book:::We Are in a Book! My favorite Elephant and Piggie Books::::Watch Me Throw the Ball! and Should I Share My Ice Cream? I'll have to check one out in the library.